Great Ocean Road The Great Ocean Road highway stretches along the South Eastern coastline of Victoria, connecting Geelong and Warrnambool. 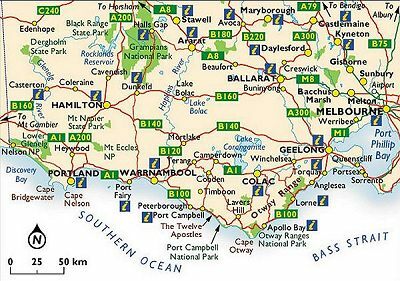 The main towns along the route are Belmont, Torquay, Anglesea and Aireys Inlet, Lorne, Apollo Bay and Port Campbell. The Great Ocean Road, which actually starts in Torquay and attracts over 2.5 million travellers annually, is known for its scenic views of both the coast and natural rock formations, including ‘The Twelve Apostles'. Follow the location links below for accommodation options.